Cosby girls finished just 20 points behind James River, to secure their “Top 2” spot in the County face-off meet next week. Isabelle Bauer, Sharon Gilman, Lauren Shoemaker, Abbey Stephens and Keilani Unkel were also treated to a “Senior Night” presentation. The girls had a fast night in the pool as three individual team records were broken by Cynthia Huang (FR) in 100 fly (58.94) and 200 IM (2:12.89) and by Lauren Shoemaker (SR) in the 200 free (1:56.97). 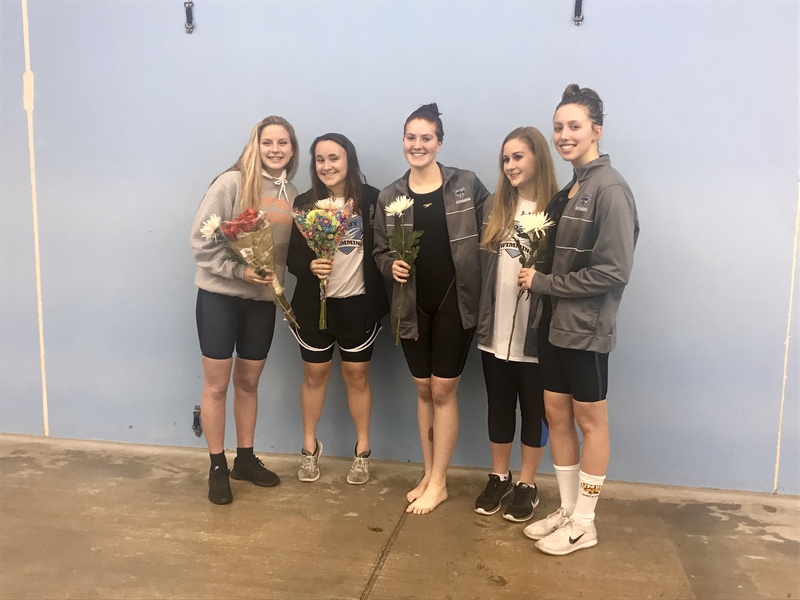 The 400 free relay record was also broken by Kylie Thompson (SO), Lauren Shoemaker (SR), Anna Watson (JR) and Isabelle Bauer (SR) as they swam to a State qualifying time with a 3:37.78. The girls have a quick turn-around with a meet against River Bend and Brook Point on January 18th, and will compete in the “Top 2” meet on January 24th.